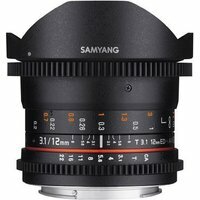 The Samyang 12mm T3.1 ED AS NCS manual focus fisheye lens for cinematography features excellent optics and a de-clicked manual aperture ring for silent, precise focus adjustment and use with video rigs with follow focus systems. The lens provides a 180° angle of view and bright T3.1 aperture to allow more control over depth of field and maximise light transmission to ensure natural-looking shots in low light situations. The distance scale and T numbers are marked on both sides of the lens for convenience. The ultra-wide angle of view provides a slightly distorted perspective and is useful for architectural interiors, landscapes and creative experimentation in any application. Compatible with Sony's full-frame a7 II, a7R II and a7S II compact system cameras.